The 7th Rural Health & Research Congress will be hosted at the Tamworth Town Hall, located on Fitzroy Street in the heart of the CBD. Full wheelchair access to the venue is available on the Marius St side of the building. If you require a wheelchair space to be reserved, please contact Alignment Event Solutions prior to the Congress. There is ample street parking and a public car park with over 100 spaces available located adjacent to the building. As a consideration to other attendees, please ensure that mobile phones are switched to silent while in the venue. For the comfort of all our patrons and visitors, smoking is not permitted within the Tamworth Town Hall. The Welcome Reception will be hosted at the Pavillion Tamworth, located 7.8km from the Tamworth Town Hall. Buses will be departing Tamworth Town Hall at 5pm for the Welcome Reception, returning once the Reception concludes. The Congress Dinner will be hosted at Congress Venue, Tamworth Town Hall. If you are attending the Congress Dinner on Thursday night, please note the theme for the evening is "Boots 'n' Buckles". 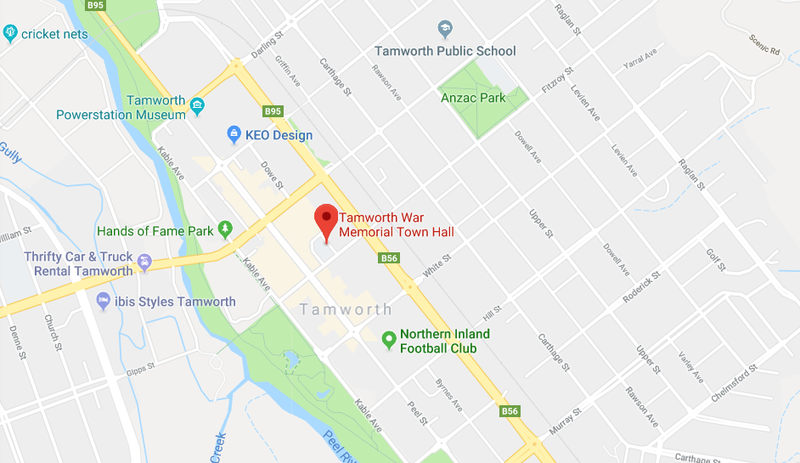 Tamworth Town Hall is located 9km from the Tamworth Airport CLICK HERE for directions.